Highlight both Mission style architecture and timeless color on your patio or deck with the Achla Black Camelback Bench. This convenient bench provides wonderful seating in your garden or lawn, while its curved back lends classic style to the unit. A tall arch on the back of the bench captures attention easily, evoking arches found in traditional, Mission style buildings, while the black, painted finish and polyurethane coating add a modern hint. Thick, vertical slats support the top arch while also creating a comfortable back to the bench, completed by a matching, 45" long seat. 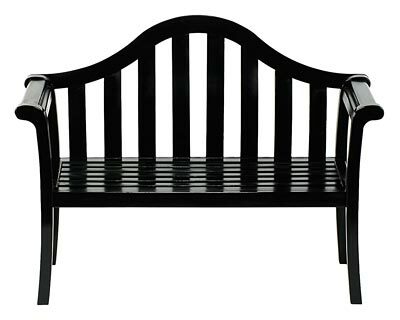 The wealth of slats here provides comfort for you, and curved arms on each side enhance the arched back for a fantastic bench. Crafted from sustainably harvested hardwood, this piece remains beautiful and hardy for several seasons, and the included hardware makes it easy to assemble. The black tone highlights the striking curves on the piece, and its wooden construction provides strength. Create a comfortable and stylish resting spot in your yard with this Black Camelback Bench. Assembly required.